German scholars, blunter than their Gallic and Anglo-Saxon counterparts, refer to it as the “Brandkatastrof,” because it entailed the incendiary obliteration of hundreds of populous settlements from Greece to Egypt and after it whole regions descended into a demographically much-reduced and materially restricted interregnum. After the galloping disaster, vestiges of the Late Bronze Age economy remained, but the system that had sustained that economy was no longer functional. An entirely new system now had slowly to conjure itself into existence based on city-states rather than kingdoms or empires. Tin, for example, so essential to the production of bronze, came largely from today’s Afghanistan through Anatolia, the geographical preserve of the Hittite Empire, and the Levant to Egypt, Cyprus, Crete, the islands, and the Greek mainland. Olive oil, preserved fish, linen, and ceramics went from the Mycenaean kingdoms like Mycenae itself, Pylos, and Thebes to Troy, Ephesus, Miletus, Sidon, and Tyre, as well as to Egypt. Slaves went from Anatolia to Greece. The Talleyrands and Kissingers of the day acted on behalf of the Great Kings to keep political order among nations and when necessary to minimize the disruption of war. The date 1177 BC is non-arbitrary in particular because it marks the break-off in the clay-tablet documentation of diplomatic and commercial activity, often in a dramatic way. Cline brings a somewhat different tone to the same topic. 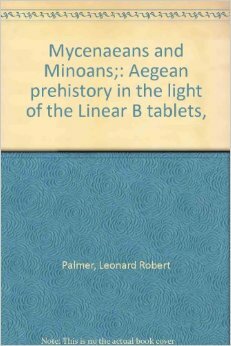 In a reference, certainly, to Palmer he writes that “earlier scholars occasionally pointed to mentions in the Linear B tablets found at the site which suggest that there were ‘watchers of the sea’ in place during the final year(s) of the site’s occupation.” Under a qualifying “however,” Cline adds that “it is not clear what these tablets are documenting, and, even if the inhabitants of Pylos were watching the sea, we do not know why or for what they were watching.” Cline declares himself, concerning the destruction of Pylos, “uncertain as to whether it was human perpetrators or an act of nature.” Given Palmer’s detailed exposition, this hesitancy strikes the reader as extraordinarily cautious. A consideration motivating Cline to such caution might be his determination to debunk the earliest explanation of the Catastrophe, a large-scale invasion of the civilized world by unified barbarous people out of the Balkans, some of whom became the “Sea People” mentioned by Egyptian chroniclers. The idea of le primitif has acquired a stigma under political correctness; contemporary historical narrative is therefore directed not to attribute pillaging, piracy, or arson to the ressentiment of savages. Yet elsewhere in The Year Civilization Collapsed, Cline acknowledges that pillaging, piracy, and arson belonged to the general upheaval of peoples during the period that he studies. As Cline recounts, the term “Sea Peoples” or “Peoples of the Sea” occurs, in the Egyptian records already mentioned, precisely in the year 1177 BC, or, by Cline’s own chronology, a mere three years after the destruction at Pylos. The Egyptian scribes could even name the species of invaders – Sherden, Shekelesh, Peleset, Weshesh from the Islands, the first two names indicating Western Mediterranean origins in Sardinia and Sicily, the third a Levantine origin, and the fourth a Cretan or archipelagic or even Mainland-Greece origin. Concerning the “Sea Peoples” Cline accepts that they “may well have been responsible for some of the destruction that occurred at the end of the Late Bronze Age, but it is much more likely that a concatenation of events, both human and natural – including climate change and drought, seismic disasters known as earthquake storms, internal rebellions, and ‘systems collapse’ – coalesced to create a ‘perfect storm’ that brought this age to an end.” Other recent writers on the Catastrophe give a larger role to acquisitive or resentment-driven violence in the making of the event than does Cline. Cline reports remarkable discoveries from Ugarit’s final decade, in particular a cache of letters written by an Ugaritic merchant Urtenu. This businessman had contacts all over the Eastern Mediterranean which appear to have been active right up to the end. According to Cline, two of Urtenu’s recovered letters make reference to merchants of “Hiyawa.” Cline identifies the Ugaritic Hiyawa with the Hittite Ahhiyawa, now generally taken as identical with Achaiwoi (Achaean), the Mycenaean self-denomination. These fortuitous divulgences support Cline’s overall thesis of the suddenness of the Catastrophe. Consciousness of encroaching destruction arrived belatedly. People seem not to have noticed that the world was out of joint and went on serenely in their daily lives as those the pattern of existence might extend through indefinite tomorrows. Cline observes the same pattern in Hittite Anatolia as in the Levant: The empire functions normally up to the terminal date and then manages to disappear almost overnight. At Hattusas, the imperial capital, some signs of violent destruction exist, but Cline proposes a different scenario: “The city was attacked only after it had been abandoned for some time.” Why abandon a city? Cline cites “drought, famine, and the interruption of international trade routes,” for which archeology can provide evidence. In the ultimate chapter of The Year Civilization Collapsed, Cline, for his part, surveys the range of suggested causes of the Catstrophe and assesses their likelihood. In doing so he makes the case for his theory of a perfect storm of calamities. Cline finds plausible evidence of an “earthquake storm” in the Eastern Mediterranean just before the Catastrophe: “It is now clear that Greece, as well as much of the rest of the Aegean and Eastern Mediterranean, was struck by a series of earthquakes, beginning about 1225 BC and lasting for as long as fifty years, until 1175BC.” Earthquakes upset the walls at Mycenae and Tiryns much of the scathing went unrepaired. Cline judges nevertheless that “although the earthquakes undoubtedly caused severe damage, it is unlikely that they alone were sufficient to cause a complete collapse of society.” Cline finds many signs of “climate change, drought, and famine” in the Eastern Mediterranean just before the Catastrophe. “Scholars,” he writes, “have long pointed to written texts that speak plainly of famines and the need for grain in the Hittite Empire and elsewhere… at the end of the Bronze Age.” Cline makes reference to a letter of complaint from Suppiluliuma II, the last Hittite king, to his vassal, Royal Ugarit “concerned specifically with a shipment of two thousand units of barley (or simply grain).” One cause of famine is drought. Yet someone threatened Pylos. If the invaders were not “Dorians” they presumably called themselves by some other name. The attackers of Ugarit have no name in the tablets, but Cline never doubts their existence. Cline follows Carol Bell in endorsing the principle that, in a general systems collapse, the existing large polities decompose into smaller polities. This is the pattern in Greece and the Levant. In the Bronze Age, a handful of kingdoms divided Mainland Greek territory among themselves; after the Bronze Age, the independent city-state or polis emerged, of which there were hundreds. The coeval Phoenician cities of the Levant also operated more or less as independent city-states. Just before reading The Year Civilization Collapsed I read Gregory R. Copley’s Un-Civilization: Urban Geo-Politics in a Time of Chaos (2013). Copley sees the existing global economy as a distorted, unstable system already embarked down the slope of collapse. The malaise of the contemporary system in Copley’s analysis stems from many of the distortions that Cline cites as contributing to the end of the Bronze Age: Centralized bureaucratization of the societies; overspecialization within the total mercantile network such that a disruption anywhere must spread its effects like ripples everywhere else; vulnerable infrastructure, such as, in the modern instance, the electrical grid; unregulated, massive migrations of peoples; and the development of enmitous social factions within societies, in some cases massively immigration-driven. Copley predicts a crisis, one effect of which will be plummeting depopulation leading to the desertification of the distended World Cities. The parallelisms between Copley’s assessment of the contemporary situation and Cline’s hypothesis about the causes and character of the Catastrophe are quite obvious and quite disconcerting. Copley differs from Cline in his willingness to include moral failures as playing a role in the impending (as he sees it) debacle. Cline explicitly disavows any gesture of “laying blame,” as when he criticizes invoking the “Sea Peoples” as agents of a general destruction in the concluding phase of the Catastrophe. Nevertheless, The Year Civilization Collapsed is extremely valuable. 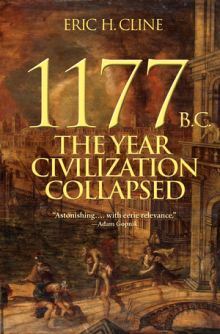 The Catastrophe is little-known – unlike the specious “Fall of Rome,” so often celebrated in novels and cinema. It ought to be better-known, as it would serve as a useful reference in getting people to understand the terrible fragility of the civilized accomplishment. One ingredient of total social calamity at which Cline hints but which he nowhere fully develops is the complacency of the people, their dumb belief that nothing can change in the way of life. The psychological inertia of complacency plays a large role in the stultification of the existing “global order,” which more and more resembles ambient disorder. Submitted by W. Lindsay Wheeler on Mon, 2014-07-28 18:58. The Sea Peoples for the most part were the Dorians. I strongly disagree with Cline. Herodotus records that the Cretans identify three invasions of Crete. The first were the Semitic Minoans, the second, were the Mynoan Greeks, and then the Dorians around 1200BC. How else to describe the Dorian takeover of not only Crete but Rhodes as well. There were Doric colonies established across the Mediterannean at this time from the Ionian coast of Asia Minor, the Greek Islands to the Peloponnese. Submitted by traveller on Thu, 2014-06-12 10:55. That I didn't read the Brussels Journal since a long time. I even had to renew my password, forgot the old one. This essay reminds me again why I have to return here frequently. Thank you professor, a very interesting essay, I learned a lot from it. Submitted by Col. Bunny on Sun, 2014-06-01 07:49.